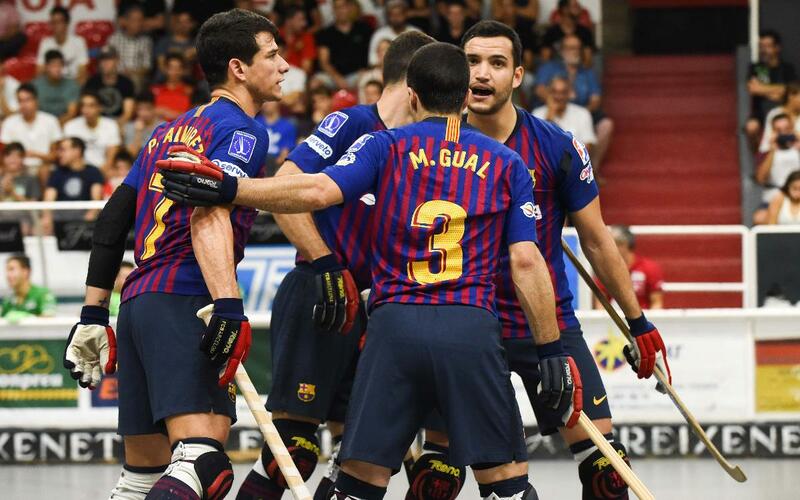 FC Barcelona Lassa rolled to its fourth straight win to start the season with a 5-1 victory at CE Vendrell and take sole possession of first place in the OK Liga. Pablo Álvarez led the way with two goals, while Marc Gual, Nil Roca, and Sergi Panadero added one goal each. Jordi Ferrer scored Vendrell’s only goal. Álvarez and Gual put Barça up 2-0 early, and the steady goalkeeping of Aitor Egurrola kept Vendrell off the scoreboard early. Roca made it 3-0 after a splendid assist from Ignacio Alabart, but Ferrer pulled one back for Vendrell just before the half. Barça dominated play in the second half. Álvarez notched his second goal of the game in the 29th, assisted by Gual. And three minutes later, Panadero netted Barça’s fifth. Barça now have 12 points after four games, and are all alone at the top of the table.